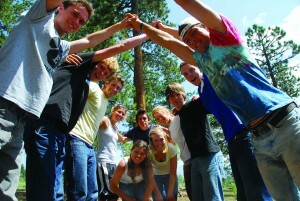 The National Leadership Council builds a culture of servant leadership that stays with students long after graduation. We cannot exist as mortals. That would ultimately fail. In order to succeed (attain sustainable happiness), immortality must be made manifest in daily existence. We must love one another unconditionally. Love is the only force. It motivates towards true progress (and progress is the law!). At that moment, he noted, he was feeling inspired in a way even he didn’t quite understand. He felt “empowered and duty-bound.” As Shane headed home, he was armed with the heightened perspective that “giving unselfishly is the best way to get real fulfillment out of life.” At home, Shane jumped onto his computer, hoping to expand this inspiration. He started reading blogs, including one called “loving life,” which eventually led him to a volunteer organization website. Within an hour he found himself serving food to homeless individuals at a local soup kitchen. Attending Principia College with many other NLC alumni, it wasn’t until she graduated that Emily started to miss the deep discussions and connections she had while in the NLC program. Shane felt much the same way. “You build such an amazing and close-knit bond with people [during NLC], but what’s the point if those relationships can’t continue to be part of all the things that make NLC great?” he says. Wishing to make the service element from her NLC experience a bigger part of her life, Emily worked with NLC Director Jennifer Dale on an alumni initiative that would not only help keep alumni connected to the NLC program, but also meet the growing interest for a service element among fellow alumni. “Service and metaphysics bring us together, regardless of age,” Emily says. Along with Shane’s brother, Kynan Witters Hicks (also from the 2010 class), Emily helped to organize and plan the first NLC alumni trip this past summer. 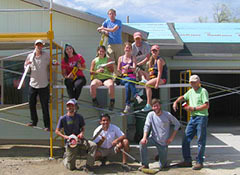 The group supported Habitat for Humanity in Chaffee County, Colorado, over three days, building the exterior framework of a house for a family in need. In the evenings, they would cook together and talk about their day. They invited speakers to join their discussions, including Chris Sheasley of TMC Youth, who explored with them their own purpose and the purpose of church – why it exists, why attend, and how its presence can have an influence in the community. Jennifer Dale also joined the group and provided ideas about how to structure their alumni organization going forward.